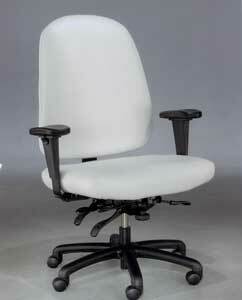 24-7 Big and Tall Office Chairs Supports up to 500 lbs. Ergonomically correct in form and function. Ultimate Series II features a 25" seat width, 25" back width and 27" back height. Foam Cushioning: Molded high resilient Ultrafoam™. The seat foam is 3-1/2" thick and the inner back is 3-1/4" thick. Inner and Outer Back: The inner back is constructed of molded contoured 7 ply 1/2" plywood and an outer back that is molded contoured 3 ply 3/8" plywood outer back which is covered with 1/2" foam. Internal back height mechanism: Standard and constructed of die cast aluminum for years of trouble free service. Internal Seat: Molded multi-contoured 9 ply 25/32" thick hardwood plywood. The seat is standard with clinch-nut machine fasteners installed to insure metal to metal connection at all attachment points. Arms: Fully adjustable arms with a durable urethane over steel arm pads and provide 3-1/4" height and 3-1/2" width adjustments. Base: The Big & Tall base is a six prong heavy duty molded reinforced structural plastic with durable caster inserts and soft contoured edges. Cylinders and Casters: Class 4 heavy duty cylinders and reinforced 55mm casters. 100 % Polyester Acrylic Backing. 65% Post Industrail Recycled Polyester. 35% Post Consumer Recycled Polyester Latex Backing.